While the focus has been on subprime woes, all mortgage loans are falling in value. In fact according to the ABX index, all credit types peaked in January. 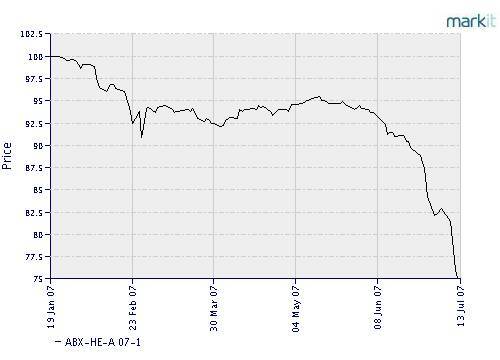 The Markit ABX ‘A’ loan derivative index chart is below. It’s down 25%. ‘AA’ loans are also making new lows. The Markit ABX ‘AA’ derivative index chart is below. The index is down 7%. Clearly the credit crunch is now moving into the higher credit ratings. Wall Street Firms and banks will have no choice but to accept the losses from mortgages. In Bloomberg’s article Bear Stearns Meets Possums in Georgia as Foreclosures Increase, homes are increasingly being seized in foreclosure by the Wall Street Firms. “The dilemma facing banks is whether to pay maintenance costs or dump the properties at fire-sale prices,” said Keith Gumbinger, vice president at HSH Associates, a mortgage research firm. Elisa Marks, a Bear Stearns spokeswoman states “the firm sold the Lilac Lane house on June 28 for $84,000… That's about half the price paid two years ago.” Keith Shaughnessy, president of Foundation Mortgage Corp., states “it will have a decimating effect on the mortgage-backed securities market when lenders start facing the music and letting property go at whatever price people will pay.” So not only are the securities (mortgage backed securities/CDO's) falling in value, so is the underlying collateral. According to Bloomberg.com, companies are canceling or postponing bond sales “amid concern that losses from bonds backed by U.S. subprime mortgages will spread to other markets.” According to Dow Jones Financial News, “seven out of 10 of the biggest leveraged buyouts have yet to be financed in debt markets.” Private-equity firms need to sell $300 billion of bonds and loans in the later half of the year to finance LBO's, according to Bear Stearns. According to the Telegraph “just $3bn of the $20bn junk bonds planned for issue for the week (Ed Note: two weeks ago) were actually sold.” So where are the bonds that Wall Street promised to sell for the Private-equity firms? Since the market won’t take them, Wall Street banks now have the junk bonds on their balance sheet. Why is it a problem? Why can’t the banks just absorb these losses? The pendulum is swinging from easy to tight money; the deleveraging process is just beginning. Homeowners are receiving a ‘margin call’ from their bankers in the form of adjustable rate mortgages. Bankers are also calling hedge funds to put up more collateral for the CDO’s. But both homeowner and hedge fund managers are so leveraged that they have no cash for more collateral. Some have already started to default. Foreclosures have increased. Funds that have been forced to close from investor redemptions or losses include: Dillion Read, Bear Stearns, United Capital, Galena Street. Much like other credit panics throughout history, major investment firms will eventually receive margin calls from their own investors/depositors because they will be overwhelmed with losses. 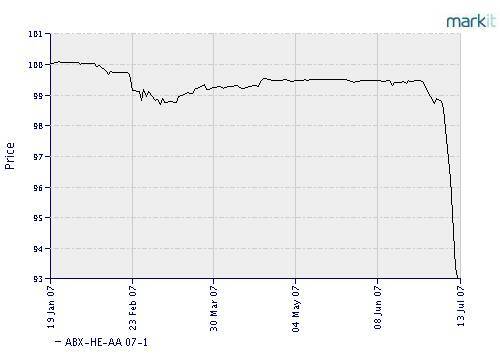 For a preview of what’s to come, Banca Italease’s shares have fallen over 50% since mid-May. The bank was forced to accept roughly $400 million in derivative bets for one of its clients. Because of the illiquidity of that market, the losses quickly ballooned to $829 million. How does this affect you? James Carrick, at Legal & General, said “we are entering ‘historically dangerous territory’ for the markets; the sudden tightness in bonds was similar to conditions in autumn 1987, a month before the crash, and again just before the 1991 recession and the dotcom bust.” When the deleveraging is in full force, homeowners, investors, hedge fund managers, and Wall Street bankers will be forced to sell more liquid assets to raise cash for their creditors. We have been advising over the last 8 months to sell assets. For most real estate investors it is too late. Much like the summer of 1929, equity investors are now being presented with an ideal opportunity to exit the stock market. It is always better to cash out with profits than to be left waiting for a buyer while the losses mount. If you are fortunate to be liquid, it is equally important to hold cash at secure financial institutions. For more about our investment management services, visit our website. Our monthly Investment Analysis Report requires a subscription fee of $40 a month. Current subscribers are allowed to freely distribute this report with proper attribution. Copyright ©2007 Lamont Trading Advisors, Inc. Paul J. Lamont is President of Lamont Trading Advisors, Inc., a registered investment advisor in the State of Alabama. Persons in states outside of Alabama should be aware that we are relying on de minimis contact rules within their respective home state. For more information about our firm, or to receive a copy of our disclosure form ADV, please email us at advrequest@ltadvisors.net, or call (256) 850-4161.